The digital issues are played out in numerous articles and also on relevant internet channels and its own internet portals. 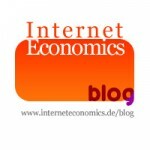 Since 2007 I am the editor of the blog “Internet Economics”. The e-journal deals with fundamental issues of Internet economy and network strategies. Since the end of 2013 I run BeaconBlog.de – the first and one of the leading German-language sources about iBeacons and Internet of Things. In addition to the technical basics, it’s all about application scenarios and use cases on the subject of sensors and iBeacons.